Hanoi (VNA) – Upturn was seen in the majority of shares on April 8, as motivated by the growth of oil and gas firms as well as banking shares. At the end of the day’s session, the VN-Index on the Ho Chi Minh Stock Exchange (HoSE) increased 8.3 points to 997.56 points. More than 163.6 million shares changed hands for nearly 3.43 trillion VND (147.49 million USD). The prices of 148 codes enjoyed increases, while those of 77 remained stable and 128 others dropped. 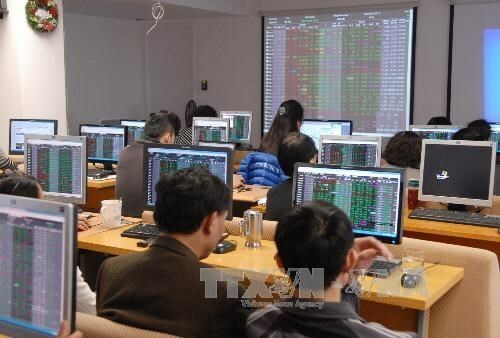 Meanwhile, on the Hanoi Stock Exchange, the HNX-Index rose 1.06 points to 108.93 points. Upturns were recorded in 89 codes, and downturns in 86 codes. Of the VN-30 group, the prices of 15 codes rose, and falls were seen in 10 others. The highest rise was seen in the price of GAS (3.1 percent), followed by VHM (1.9 percent), DPM (1.9 percent), and VIC (0.3 percent). Meanwhile, the sharpest drop was seen in the price of VJC at 2 percent. In the oil and gas group, the price of almost all codes rose, with PLX at 2 percent; POW, 1 percent; BSR, 2.3 percent; OIL, 1.4 percent; PVB, 3.4 percent; PVD, 4.1 percent; PVC, 4 percent; and PVS, 4.9 percent. Similar growth was seen in shares of banks, with VCB rising 2.3 percent; SHB, 2.7 percent; ACB, 2 percent; CTG, 1.8 percent; and BID, 1.3 percent. In the HOSE, foreign investors bought 2.56 million shares with 144.49 billion VND. The best seller of the day was MSN with over 50.33 billion VND worth of transactions, followed by VCB with 40.8 billion VND.